Here we are, it’s the Day After! Day after General Availability of Windows 8, and the availability of Microsoft’s Surface RT Device. What an awesome 3 days it has been and the excitement around the whole happening was felt all over the world. I tweeted somewhere this week, its like Christmas, with all the warm happy feeling all over the place. If you want a low-down on the coverage of the GA event, please listen to Richard Hays, my buddy’s podcast Observed Tech PODCAST Episode 67 or the Compromised and Confused Product Show where he gave the blow-by-blow account of the whole event. 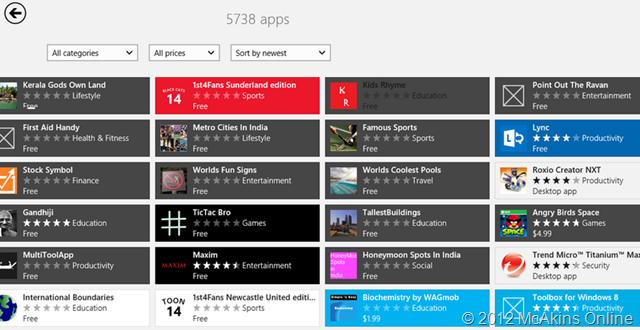 Well, this post is about the Windows Store and its Apps, and boy what a week we’ve had! App started dropping as early as Monday, became a stream on Tuesday, became a river on Wednesday with the Tsunami on Thursday 25th. The most important quality apps dropped on Early on Thursday, with Angry Birds Space dropping after the keynotes late on Thursday. Some people were not happy that Microsoft did not discuss apps on the Keynotes, I think I understand why. When you are dealing with important Partners, you cannot to single out one or two without jeopardizing your relations with the others. You either mention them all or not, and given the limited time you have for the keynotes, you just can’t demo just a few ones and leave the rest. Anyway, back unto our post. How many quality apps dropped this week, haha, don’t even tempt me. I will just point you to the list here below as I can’t possibly mention individual apps in detail. But standing out of this list are the popular Newspaper apps like WSJ, NYT and Fox News Apps. And Angry Bird Space of course. But Disney also debuted this week in the Store with a dedicated app for Girls; Princess Dress-Up. Also, Microsoft debuted and updated some apps. For example, Skype App made a grand entry this week, as well as Lync Metro Client. A few XBox Titles also released this week as you can see. OneNote also dropped the MX predicate and became a full Metro App. No more preview thus. Of course outside of the Store but worthy of mention is the Office 2013 package for Windows 8 that has gone from Preview to Released status. If you have MSDN or TechNet account, please go ahead and download it for your Windows 8 device. Corel, Adobe and Cyberlink are owning the Store right now with the 3 outdoing each other in who releases the highest number of Apps this week. They are bombarding the store with both Metro and Desktop apps. Just search for their names in the Store and see for yourselves. But the company that MS should thank for the current total number of apps in the Store is Wagmob. A company that produces Educational pieces. You’ll see a lot of this company’s apps in the Store. Thanks to companies like Wagmob, Education category even beats the Game category this week. The Store itself has been polished by Microsoft, and the bitmaps of the leading apps are now used to to present categories. The Top Free and Most Rated buttons are now working as expected. But the general issues that plague the Store still remain. With the noise of people like me, lets hope MS will eventually listen. I said its going to be a crazy week, well you can see the result of this week in the Stats. 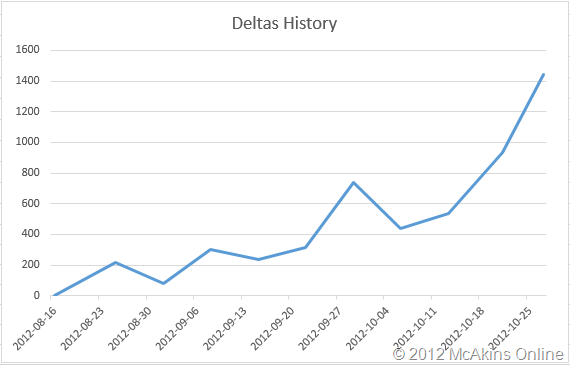 We had a total delta of 1446 this week, almost 1500 apps added to the Store in one week! Talking of a big bang. There is definitely something in the store now for everyone. There are still some apps we missed, like the IMDB and official Twitter and Facebook Apps, question is when these apps are going to drop in the Store. 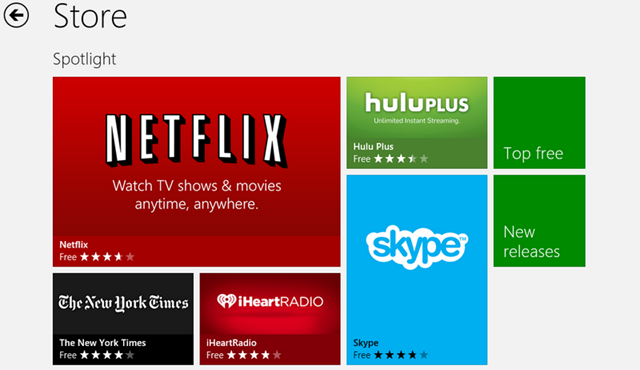 One thing is sure, every self-respecting business is now on Windows 8, even Google is in the Store now. Fox Now – The Third Fox App in the Store! The New York Times App is now in the Store! There you have it. Lots and lots of apps for one week. There are lots of chaffs but there are lots of quality apps too. I am sure you will find something for yourself in the Store. Of course I only mention the most remarkable and quality apps on this blog. So if you think I missed anything, please let me know. On a closing note, if you’ve purchased Surface or any of Windows 8 devices this week, please make sure you obtained and install all the latest updates before use as there were lots of updates after Windows 8 went RTM. The same goes for Office 2013, please download the latest version as the RTM version had issues. And if you have any problem, reach us Windows 8 community on Twitter via the hashtag #Win8, you will definitely find help. Enjoy your week ahead, and if you’ve bought a shiny toy on Friday, most especially . See you next weekend. RTM Store news is Archived here if you want to review it. All data and Information provided in this report is provided AS-IS! It does not warrant any commitment neither from me nor from Microsoft. 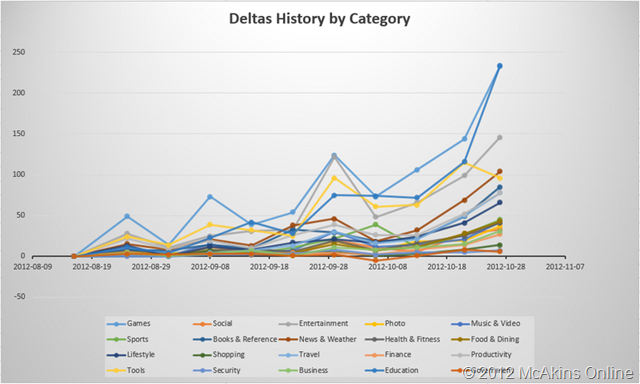 The data is tallied from the information Microsoft made visible to the outside world, and is subject to change at any time. Applications are constantly being submitted and pulled from Store, and also subject to Store Cloud propagation, which means the data you see here may not be current at any time, and possibly different from your part of the world. Errors in this report are mine and not Microsoft’s and does not constitute any binding agreement.